We are currently experiencing a temporary existential crisis. One Halfling from Casting Room Miniatures. He looks like he’s on watch duty, but he will also serve as part of the Halfling Hollow Defence Committee Militia unit of spear. Well I also added some shields to these guys I painted just over a year ago (to make them look just a tad more formidable… or something approaching formidable… or at least less like s squishy speed bump…). The rest of the Halfling Hollow Defence Committee Militia will be a mix of Light Missile (which may or may not have the Sharpshooter upgrade… though I’m thinking I might leave that one to Elves… I don’t want the Halflings to be TOO effective!) 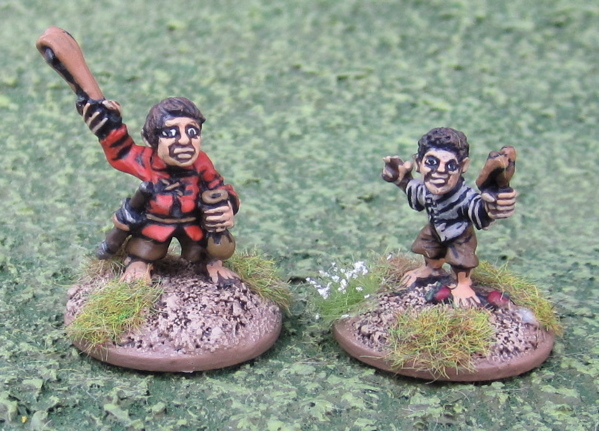 and a few Scouts and/or Hordes. North of the lands of the “Bunny Baron” - Phillipe du Lapin - across the swift-flowing Rosban River lies the dark woods of Malvernill. The woods are inhabited by a reclusive tribe of Elves. It is rare that the Elves are seen beyond their woods – but they fiercely defend their lands against any foolish enough to encroach upon them. Here is a typical warband of the Melvernill that would be sent out to turn back any force entering their realm that was too large for the rangers that patrol their borders to handle. The Elves of Malvernil travel light and always by foot. They favour ambushing tactics – striking fast and furious from where their enemy would least expect it. The force is organized for Dragon Rampant. The Warleader (chosen by the council that governs the tribe) and his warriors. The Rangers would be classified as a Light Missile reduced figure unit with the “Sharpshooter” upgrade. All the figures (except for one) are from Games Workshop (the one exception being from Hasslefree Miniatures). Thought the hasslefree mini fits in well enough, I would like to pick up ONE MORE wardancer to complete the unit. I also wouldn’t mind picking up three more of those older leafy-cloaked GW Wood Elf Way Watchers for my ranger unit…. The Boy and I have been talking about Dragon Rampant a bit lately and discussing warbands we might field. The Boy is mostly focused on an Orc Warband he is painting up at the moment. I wasn’t sure how he’d take this new force when I presented it to him as a potential opponent – thinking he might be suspicious and/or put off by the numerically tiny force compared to the hordes he is having to paint up – but as it turned out he was rather pleased to see that it wasn’t ALL archers that would pin-cushion all his forces before they even made contact. I think he is rather looking forward to clashing with these guys! 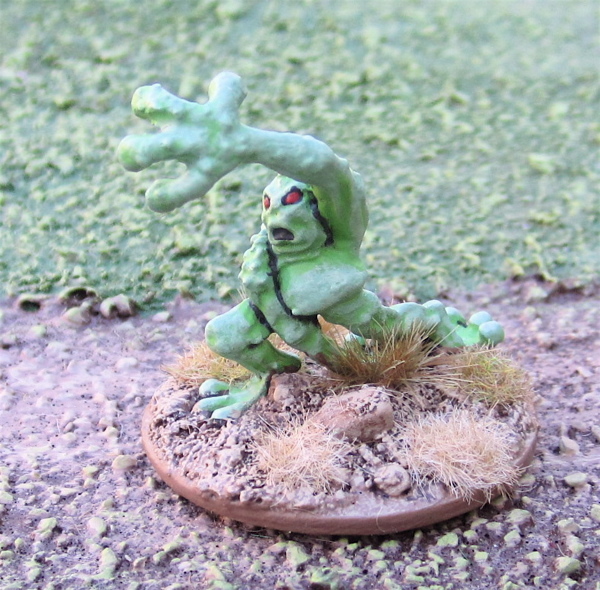 These are some old I-Kore Keltos goblins I’ve had kicking around for some time. A while back (over a year ago… maybe two!?) I started them, painting the flesh… and then got busy with other things and during a desk purge they got tucked away into the goblin drawer to be finished at some later date. I guess last night was that date. I’ve been thinking about Lion Rampant and Dragon Rampant a lot lately and planning and working towards building assorted warbands and retinues. While I’ve mostly been concentrating on the Halfling Horde these last few weeks, I’ve also been looking at others and trying to figure out what I would need to finish various forces. 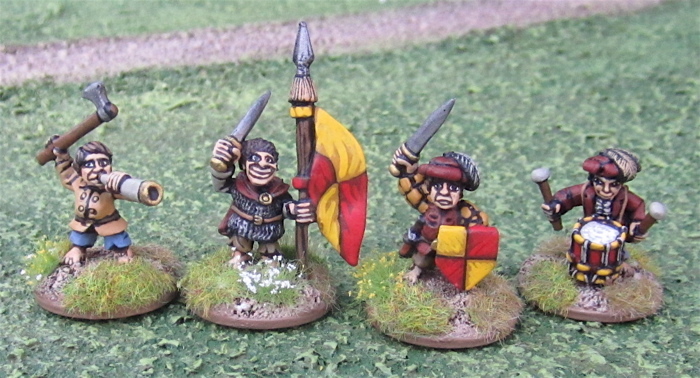 I do have a lot of Hordes of the Things elements I could easily use in the game (like we did for our first game)… but I do like having dedicated forces for particular games and while I like multi-figure bases for DBA/HOTT… I like having the individual bases for Lion Rampant and Dragon Rampant…. I’ll have another post up in a few minutes with some Elves I’ve put together into a warband. 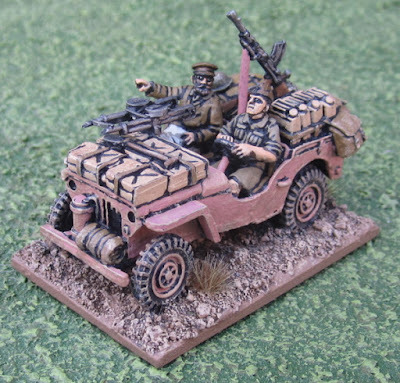 The Goblins above could be a (second) Scout unit of their own, or I could combine then with some similar figures I painted a few years back (which I was already using as a scout unit) to make a complete Light Missile units. Some strange creature I found in the lead pile that I thought I’d use as an Imp in Frostgrave. A Wood Elf warband for Dragon Rampant. Wow… it’s been three weeks since my last post… It’s been a busy month around our house and I haven’t been doing nearly as much painting. I can’t even remember when I last played a miniature game… (Oh wait, yes I can – it was the Frostgrave Campaign weekend! Over a month ago…). We have gotten a few board games in over the last month. First are a few female adventurers from Casting Room Miniatures that I picked up for a Frostgrave warband (to go with the Blue Wizards I painted last September. Here’s what they look like with the rest of the Warband so far…I'm not sure what sort of wizards they might be... Illusionists, maybe...? 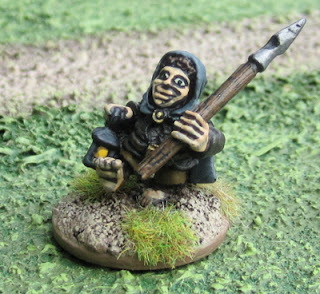 A command element - the leader of the Halfling Hollow Defence Committee Militia along with his standard bearer and a few musicians. A few more members of the militia. 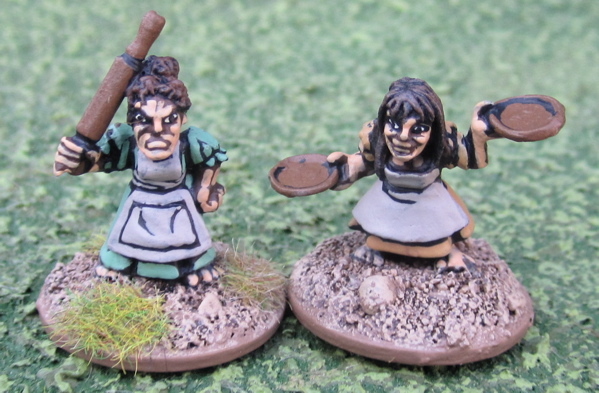 One of the main reasons I picked up all of these - there are female halflings! A fellow taking a nap. 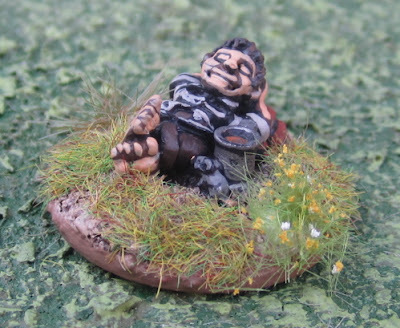 I thought I might use him as a casualty/battered unit marker - halflings never DIE they just tire of the business and wander off to have a good nap! I could have them organized into more separate units of Light Foot and Light Missile – but light foot get the “wall of spears” special rule… and I only have a half dozen Halflings with spears… so I thought mixed units of hand weapons and bows might work (as the mixed units drop the “wall of spears” rule). I have a few more of these Casting Room Miniatures to finish up – along with a handful of old Ral Partha Halflings (which look like Halfling children next to most of my other Halflings… and that’s probably what I’ll use them for! 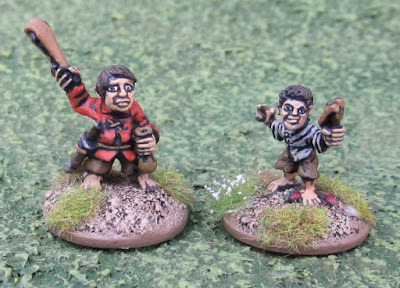 Younger members of the Halfling Hollow Defence Committee’s Militia). Stay tuned for those in the coming weeks. This is the first of a trio of SAS jeeps from Perry Miniatures. 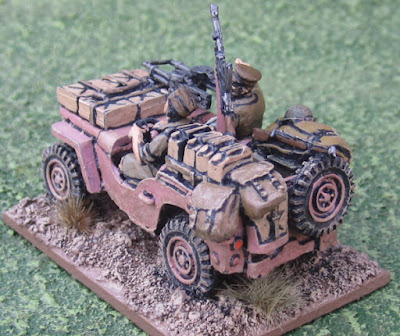 I don’t know if any of the SAS jeeps used in WW2 were painted pink… I do know that some British units, at different times, used pink to camouflage desert vehicles – including some of the LRDG trucks. And I’m pretty sure the SAS and LRDG had a fair bit of latitude when it game to customizing their own equipment… So I figured why not paint one of them pink for giggles. The rest will probably be done in some sort of tan. 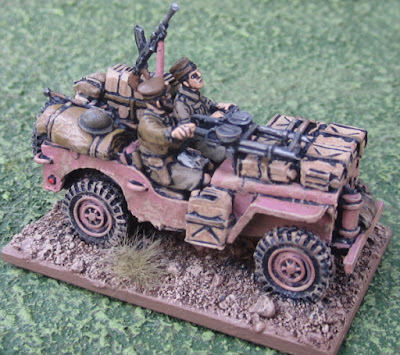 I also have a pair of SAS jeeps from Company B (with the Rat Patrol crew… again, for giggles…) to paint up and another from Warlord Games on the way (along with two LRDG trucks!). I’m not entirely sure why I picked them up at this point… It seemed like a good idea at the time…? Of course NOW I’m going to have to find a bunch of trucks to make up a convoy for them to attack – or some airplanes to line up on a runway for them to destroy… and do I get 1/72 or 1/48….? Just a few 1/48 aiplane models could end up taking up a bunch of space on the tabletop – but 1/72 might look a little small… There’s a raid scenario in the new Bolt Action campaign book Duel in the Sun. I wonder what scale of models they imagined people would use in that…?